This week David Cameron kick started his negotiations with the European Union to head off the risk of a Referendum vote to leave the European Union due to be held some time during 2017. The latest opinion polls put the LEAVE camp in the minority on 39%, however faced with continuing out of control immigration could by referendum day bring the vote closer to a 50/50 knife edge result. By most accounts David Cameron's demands in his letter to to Donald Tusk (President of the European Council) are pretty weak, most of which are designed to be achieved in what amounts to a pantomime act for an gullible electorate to swallow. Nevertheless of the four requests for reform, the one that is most likely to result in a vote to leave the EU is likely to be met with the most resistance. The UK believes in an open economy. But we have got to be able to cope with all the pressures that free movement can bring — on our schools, our hospitals and our public services. Right now, the pressures are too great. The issue is one of scale and speed. Unlike some other Member States, Britain's population is already expanding. Our population is set to reach over 70 million in the next decades and we are forecast to become the most populous country in the EU by 2050. 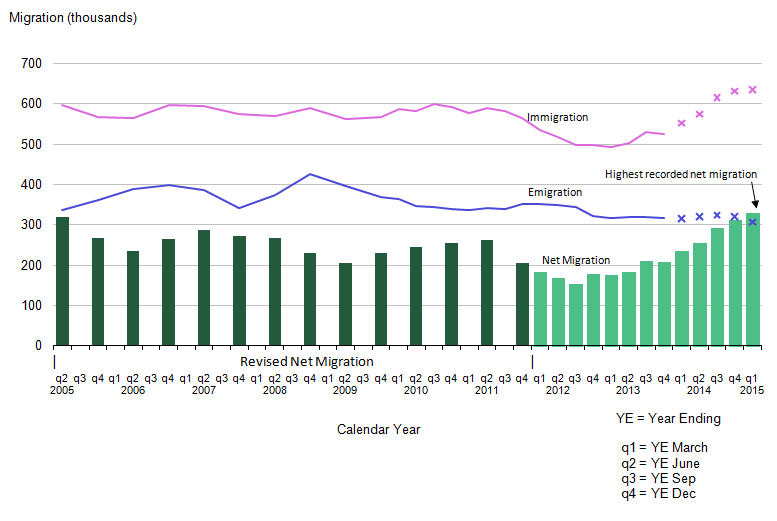 At the same time, our net migration is running at over 300,000 a year. That is not sustainable. We have taken lots of steps to control immigration from outside the EU. But we need to be able to exert greater control on arrivals from inside the EU too. Britain has always been an open, trading nation, and we do not want to change that. But we do want to find arrangements to allow a Member State like the UK to restore a sense of fairness to our immigration system and to reduce the current very high level of population flows from within the EU into the UK. These have been unplanned and are much higher than forecast — far higher than anything the EU's founding fathers ever envisaged. These very substantial flows of population have, of course, also had a significant impact on a number of Member states, many of whose most highly qualified citizens have departed en masse. So this is a shared challenge. We need to ensure that when new countries are admitted to the EU in the future, free movement will not apply to those new members until their economies have converged much more closely with existing Member States. We also need to crack down on the abuse of free movement, an issue on which I have found wide support in my discussions with colleagues. This includes tougher and longer re-entry bans for fraudsters and people who collude in sham marriages. It means addressing the fact that it is easier for an EU citizen to bring a non-EU spouse to Britain than it is for a British citizen to do the same. It means stronger powers to deport criminals and stop them coming back, as well as preventing entry in the first place. And it means addressing ECJ judgments that have widened the scope of free movement in a way that has made it more difficult to tackle this kind of abuse. I look forward to discussing these proposals further so we can find a solution that deals with this issue. 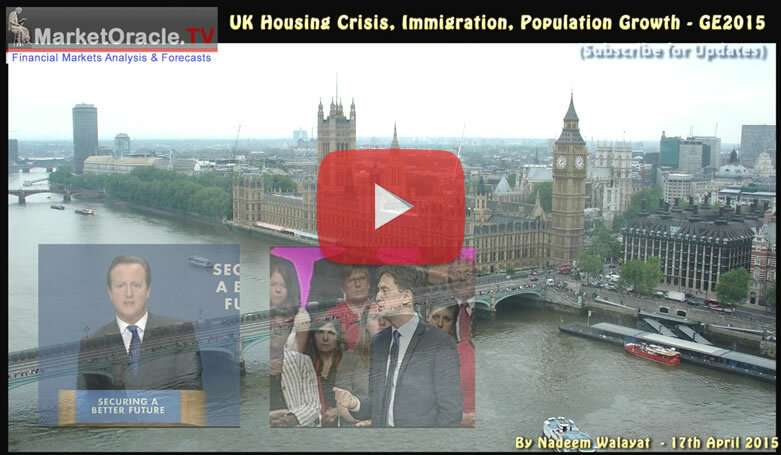 The ONS recently illustrated the crisis trend by forecasting a 15% rise in the UK population from 64.6 million (mid 2014) to 74.3 million by 2039 (25 years time), approx 70% of which will be due to continuing out of control immigration from predominantly eastern europe as 7 million more economic migrants will seek to jump on board Britain's benefits gravy train (in work and out of work benefits) that typically can amount to more than X5 that receivable in eastern europe. As expected the bulk of the ONS population forecast increase is for England to absorb an additional 9 million people. The blatant flaw in the ONS population forecast is that they expect net migration of just 5 million over the next 25 years i.e. at the rate of 200,000 per year when the actual trend of the last decade is towards an exponentially increasing number that already stands 330k per annum i.e. 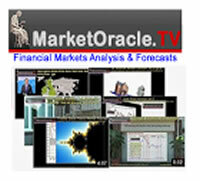 reality is 65% higher than the number that the ONS are factoring into their forecast. Not only that but the trend is likely to continue onwards and upwards to 400,00 per annum, and to nudge above 500k within a decade that would convert into the UK population reaching 74.6 million not in 25 years but in just 15 years time! To illustrate the point recent immigration statistics show net migration of 330,000 per annum against David Cameron's long standing election promise of net migration of in the 'tens of thousands'. The updated UK population graph shows an actual trend trajectory as per the most recent ONS population data into Mid 2014 of 64.6 million, which suggests that the UK population could increase by an additional 4 million by 2030 to 74.5 million which is line with the earlier projection based on accelerating net migration and further confirms that the ONS forecast for 74.3 million will be reached a decade earlier by about 2030 as a consequence of what amounts to continuing out of control immigration and high birth rate that in total would translate into a population increase equivalent to 15 cities the size of Birmingham. The key impact on the prevailing bullish trend in the house prices will be if the UK government is ever able to bring net migration down to under 100,000 per annum, which I imagine could only be achieved if Britain left the European Union. What's lost in the midst of this years migrant crisis of as many as 1 million migrants heading for Europe's shores, near five times the number for 2014, is the consequences of the REAL MEGA-TREND, and not just of the war in Syria but the fact that Africa (North and South) is undergoing an population explosion, that is literally manifesting in an exponential trend, one of MORE than doubling of Africa's population every 40 years that looks set to make today's migrant crisis look like a picnic when compared against several millions per year that will be heading for Europe's shores in the not too distant future as the following global population graph based on UN data illustrates. To imagine that a rate of population increase of approaching 30 million per year is not going to encourage migration in the millions to Europe is tantamount to sticking ones head in the sand, which is precisely where a blinkered European Union has firmly stuck its head for the past 2 decades, completely ignorant of the consequences of Africa's population explosion for if Europe cannot cope with today's 1 million per annum then what is going to happen when 2 million, 4 million, and then 8 million per annum flee the chaos of an over populated Africa that over 150 years will have gone from a population of 228 million to 4.2 billion! 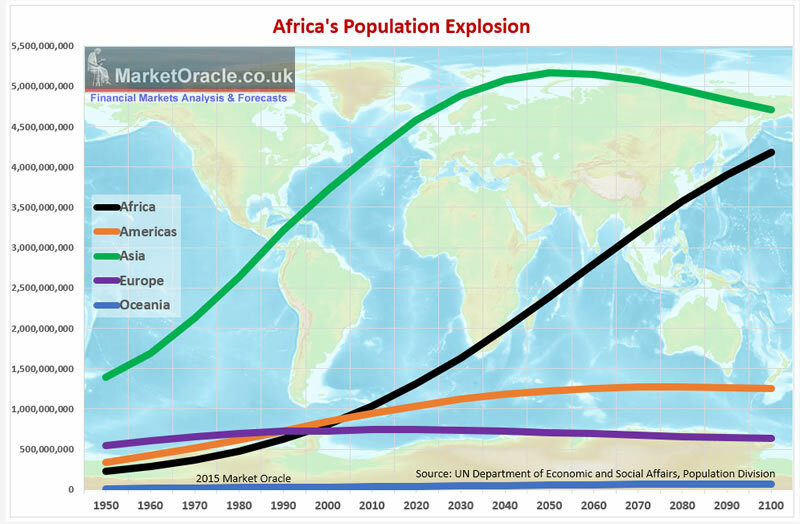 In 1950 when Africa had a population of 228 million, Europe's population was 550 million, today Africa's population has soared to near 1.2 billion against Europe that is peaking at 740 million that given a quadrupling in Africa's population to 4.2 billion could in a worst case scenario be on the receiving end of as many as 500 million migrants over the next 85 years from Africa alone (5.8 mill average per year).